The last few years have seen a major crackdown on dangerous hits to the head and knee, which have even instigated a few rule changes and a myriad of suspensions. However, just like the real world, the criminals always remain one step ahead of the law on the ice. Clearly it was a hit against the rules. 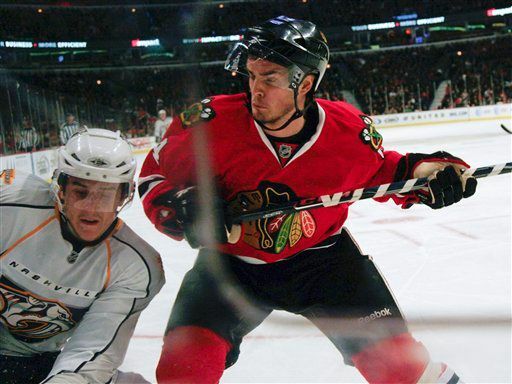 Hjalmarsson received a 5-minute major for boarding, and a game misconduct for his part. Although he doesn't have a cheap shot history, Hjalmarsson, according to TSN "is scheduled to have a hearing with NHL disciplinarian, Colin Campbell at 1pm et." "Everything happened so fast," he said after the game, but as the Buffalo announcers point out in the broadcast, Hjalmarsson saw nothing but the numbers on Pominville's back as he approached him. On the video you can see that Hjalmarsson starts toward the area where that hit occurred from the blueline. He coasted toward Pominville before he propels into him for the hit. How fast could it have happened while gliding 20 feet or so while looking at the guy's back? In no way does it look like a malicious hit, but careless plays endanger other players just the same. What Is Wrong With Marc-André Fleury?